Last week I spent six days exploring Chicago, it was my first visit to the city and after reading guidebooks and looking on Instagram I was geared up for some great food and drinks… it didn’t disappoint. Chicago has so much to offer someone in search of good food, restaurants and bars everywhere you turn and all covering so many different cuisines and styles. Laid back sports bars, microbreweries, high end bars and restaurants, cafes, diners, so many to choose from! As I’m a bit of a geek and like to be slightly organised I’d done a bit of research and made a list of some places I wanted to try, but equally we spontaneously happened upon so many places which turned out to be great too. Breakfast, the most important meal of the day turned into a highlight, we were spoiled for choice (a reoccurring theme!). Some of the best places we went to were Kanela Breakfast Club – which had a brilliant varied menu, the sriracha hollandaise was so good, Goddess and the Baker – delicious avocado toast and amazing juice which came served looking like a cocktail, Beatrix River North – strong coffee and spicy shakshuka. After the big breakfasts we didn’t really need lunch, the odd snack and a coffee or a beer kept us going through the day! A couple of nights whilst we were there we had tickets to see ice hockey and basketball. It’s been a dream of mine to see the Chicago Bulls play since I was a kid, I finally got to see them, my favourite player didn’t play and they lost by a point… still it was a great night and the atmosphere was electric, plus they sold margaritas by the pint in the arena! Before the games though we wanted to find some sports bars near the United Center, the kind that the local fans would be at. We got recommendations and one place kept being mentioned, we saw the place and decided it wasn’t for us! We moved on and went to WestEnd one night and Park Tavern another, both turned out to have great food and they were full of locals headed for the games. Both served standard American style food, burgers, mac and cheese, nachos, what you’d expect. The beer choices at Park Tavern were amazing, over 40 beers on tap, plus we arrived just before the end of happy hour so we could take advantage of half price beers – our sever encouraged us to get a couple each before the prices went up! On the other nights when we weren’t at games we tried out a couple of places in town and on one night be ventured out to the suburbs. It got to our last night and we hadn’t yet tried deep dish pizza, which we obviously had to do, we’d been asking locals where to try and none seemed to agree, they all had their own favourites for different reasons! We tried to get in to the place where it’s said to have first been created, Pizzeria Uno, but it was a Friday night and when we arrived it was too busy, so we ended up at their sister restaurant, Pizzeria Due. It was unlike any pizza I’d had before, cheese on the bottom, then toppings, then sauce all in a huge crust like an open pie. It was tasty but ridiculously filling, two slices and I was done! With no more room for beer we went for a walk and made our way to Andy’s Jazz Club for an old fashioned and some music to end the night. There’s so many more places to eat and drink that I could ramble on about but I’ll just give you a couple more quick highlights! Cindy’s – rooftop bar overlooking the Cloud Gate, the park and the lake. Eataly – a huge two story place with Italian delis, restaurants, bakeries, cafes, bars. Beautiful cakes. I bought some different dried pastas to bring home – my souvenirs always seem to be food related! Garrett’s – popcorn shop, a local tradition. Cantina Laredo – a Mexican restaurant, we went for drinks at the bar, really good margaritas. We ended up ordering guacamole made table side, this was amazing! Tortoise Supper Club – a 1920’s style bar, though it may not look like it is from the outside. Really great cocktails, get a martini. The Green Mill – in Uptown, worth getting out of downtown to visit, an old haunt of Al Capone’s. Live music, perfect for a cocktail and dancing! In between all the eating and drinking, we obviously saw some of the sights! We did the Tilt at 360 Chicago, you essentially lean on a glass panel whilst they tilt you out over the edge of the building, oh yeh, you’re on the 94th floor! Amazing views and not as scary as it sounds. We visited the pier, museums, galleries, did the bus tour which showed us all the sights. I’d definitely recommend you visit if you get the chance. Great people, architecture, art, sports, music and of course food and drink! I’m a big lover of street food. Going to street food markets is a great way to try something new, there’s usually at least one dish I’ve never come across before. I’ve written about Peddler Night Market in Sheffield before, it’s a monthly street food market. Whenever I’ve been before it’s been raining, this time was no exception! I’m determined to go one time and not be wearing loads of layers hiding in a corner trying to keep my food from getting rained on! Aside from the wintery weather I had a great time. This month it was a veggie special called Veg Out, as the name suggests, all the food on offer from the traders was vegetarian or vegan. Safe to say I was spoiled for choice! There were some familiar street food traders and some I’d not seen before. Firstly we had a wander around the craft stalls and I bought a beautiful whale t-shirt! Now to the food, time to check out all the menus before making a snap decision! After debating between bratwurst, Thai food, dim sum, mac and cheese, pizza and loads of other choices, we finally opted for Latin American food from Yakumama. The BBQ oyster mushroom arepa – homemade Colombian maize bread grilled and stuffed with BBQ oyster mushrooms, avocado, homemade vegan aioli, homemade habanero and pink peppercorn sauce, lettuce and coriander. It was unlike anything I’d had before. Crispy maize bread which was soft and warm on the inside and the fillings were a great combination. I loved the habanero and pink peppercorn sauce. It was some of the best street food I’ve had. Something new and exciting. It’s definitely inspired me to check out some Latin American recipes. I have to have figure out how to make that sauce too, better stock up on chillies and pink peppercorns! Time for a beer, it was clearly marked which beers were vegan, I decided on Juice Springsteen, a tropical IPA which was deliciously fruity, I imagine it’d be a good summertime drink. Whilst we had a beer in the chilly weather, we bought some battered pickles from the Hip Hop Chip Shop. A perfect snack to have with a beer. We were planning on getting brownies but we were too full! The market was on from 12 and we arrived not long after that, it was already bustling with people. Every time I visit Peddler early I expect it to be quiet and I’m always proved wrong! It’s so great to see Sheffield get behind the market. Particularly this time with it being an all veggie and vegan event. I really hope there’s another Veg Out later this year, go on Peddler, please! My plan for the new year is to try and use less plastic. Many people have been inspired recently after watching Blue Planet 2 which is great, we just need to keep that momentum up and get more people making changes. I know it’s not always easy, but getting a reusable water bottle and coffee cup is a good way to start. I’ve been using them for a couple of years now but still used to buy bottles of water and have single use coffee cups when I forgot my reusable ones. This year I plan on making the reusables something I don’t leave the house without. I already have metal straws in my house too, but I need to remember to ask for drinks without a straw when I’m out. Over Christmas I went to a pub and ordered a lemonade, which came with two straws in, totally unnecessary! The more people that make the changes I’m describing, the better. Seemingly small actions like this can make a huge difference. Another thing I saw today that spurred me to write this blog was an article in the news that Marks and Spencer are stopping selling some of their products that are ridiculously packaged. I’ve been ranting about products like this since I first saw them on supermarket shelves probably more than a year ago. Who wants to spend £2.50 on a slice of cauliflower wrapped in plastic and marketed as a cauliflower steak. Save yourself some money and the world another pile of plastic waste! I understand that some people are unable to cut fruit and veg, but the packaging for this is a real problem. Plus it seems that the aim of these products isn’t to help people who are unable to cut veg, it’s to sell them to people following food trends. These aren’t all even convenience products, some are a joke. Selling a coconut and a straw wrapped in plastic is ludicrous, a coconut comes in natural packaging. You’d be hard pressed to damage it on the way home from the shop, and if you did miraculously smash it up on the way home, some plastic film won’t help. Hopefully something has inspired you to make changes towards your use of plastic products. Go on, find that reusable coffee cup out of your cupboard, treat yourself to a reusable metal water bottle and say “no straw thanks”! Read more about the plastic waste problem in this article from the BBC. 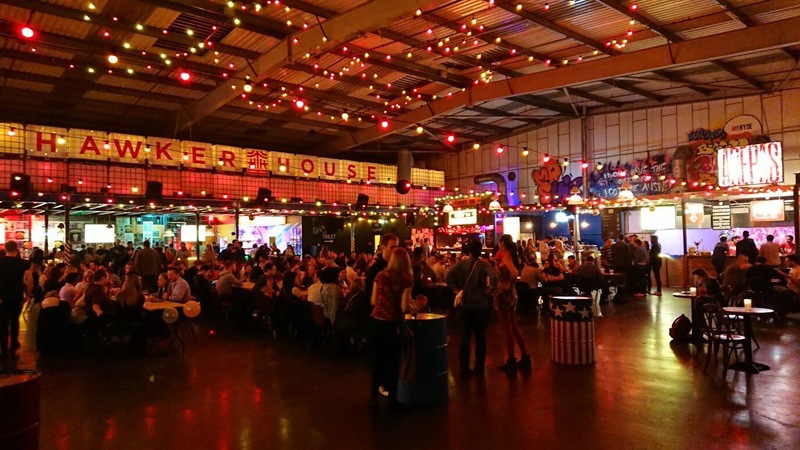 I’ve been to a few street food markets in the UK, but my visit to Street Feast’s Hawker House in Canada Water, London was my favourite of all. It was Saturday evening, we’d had a day drinking at a rum festival, so were in need of food! My sister and her boyfriend lead the way to Hawker House, an old warehouse that’s been transformed by Street Feast into a street food heaven. There was close to 20 food traders to choose from, and I’m pretty sure I counted 8 different bars, I’d had a lot of rum but I wasn’t seeing double! So first things first we needed a beer, draft Sierra Nevada, to bring back fond memories of California. We found a cosy candlelit table up on the mezzanine which housed the Tequila vs Rum bar, the shots happened later in the night! As me and my sister sat and had a drink and a chat, the guys went off in search of food, they came back with brisket burgers, clearly not my kind of thing! It was our turn to go and check out what was on offer. Loads to choose from, almost all of the stalls had at least one veggie or vegan option. We did a lap first, checking out all of the menus so as not to make a snap decision and miss out on something. My sister, who’d been before, said we had to get the tofu steamed buns from Yum Bun, so they were a must. We decided to share so we could try more things. Along with the steamed buns we got yuca fries from Petare, a Venezuelan stand. The fries were good, super spicy from the hot avocado coriander salsa. But the steamed buns were definitely my favourite, silky buns, crispy tofu, garlicky choy sum with sweet fruity chillies. A perfect combination. Definitely seek them out if you’re in London. I’ll be hunting them down next time I’m there and trying to replicate them at home in the meantime! We chilled out with a drink for a bit then decided we were ready for more, we decided on something classic and went for wood fired pizza. Plum tomato, mozzarella and fresh basil, simple and tasty. After a shot of something that tasted like apple pie crossed with popcorn, we were done! Full and ready to find our way home. If you’re in London on a Friday or Saturday night and hungry for street food, give Hawker House a try, you won’t be disappointed. 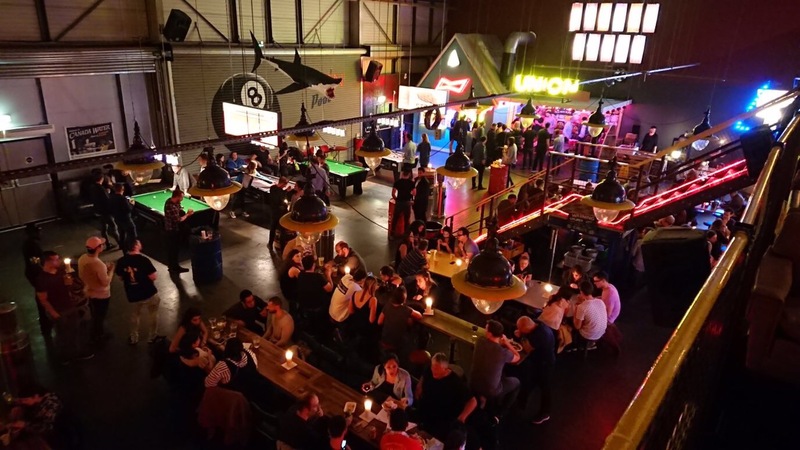 Loads of choice, chilled out atmosphere, pool tables and beer pong, fire pits outside, an all round great place to spend an evening. Last Friday night I was home alone for tea, this is usually the time when I reach for the arborio rice and make risotto. No risotto this time though, mostly because I didn’t have the ingredients and didn’t want to venture out to get them! This time I raided the fridge and cupboards and created a version of spaghetti alla puttanesca. This Italian recipe translates into English as, whore’s spaghetti. Yep, that’s what I made on Friday night after a busy day at work… I work in marketing don’t get any ideas! There’s loads of suggestions as to how the dish came about and got it’s name but it’s essentially a quick, tasty dish to throw together without many ingredients, most of which you probably have in the back of a cupboard in your kitchen. Quick and easy! It serves two people, generously. I wasn’t greedy and ate the whole lot, there were leftovers! Start by getting a pan of water on to cook the pasta. While that’s getting going finely slice the garlic and roughly chop the olives. When the water has come to the boil add salt and the spaghetti and cook as per the instructions on the packet. Heat a frying pan on a medium heat to make the sauce, add a little oil, then add the garlic. Gently fry for a minute, then add the olives and the chilli flakes. Leave these for a minute, then add in the tomatoes, and if you’re using plum ones, crush them with the back of a spoon. Leave the sauce to simmer until the pasta is cooked and then drain the pasta and add it to the sauce. Simple as that. Drizzle with olive oil and fresh herbs if you have them.